Seems like we should have had those meetings in October after all. Because no City Council Meetings were held in October due to the Election we had a stacked calendar tonight. They had the Utility Users Tax on the end of the agenda and choose to address that TAB item first. What that TAB item was for was city staff laying out the ground work for the workshop that will be held November 20th. What seemed the hardest was getting the council on board to attend the workshop, the biggest problem maker was Joe Baca Jr. I’m not sure if he was still licking his wounds from November 6th or if he really only cares about parks and that’s it but he had a scheduling conflict with that day and refused to adjust his schedule. What the UUT (Utility Users Tax) is the 8% tax on all the utilities you use in the city of Rialto and amounts to a little more than 11 million dollars for the general fund. The way it was sold 5 years ago was a tax to help pay for Police and Fire operations looking back it was probably sold the same way Measure “V” was if you don’t vote for this the police and fire will suffer. I was young and not living in the city back then so I was listening to what my parents, in laws & friends were telling me about the UUT. What’s scary now is they began floating the idea of raising the percentage to as high as 12% as a way to punish voters for not falling for their lies with Measure “V”. I don’t like this tax but if they are straight with the community and don’t raise the percentage because it means such a big piece of the general fund. What also was annoying was the fact that things are changing with the sale of Rialto’s water and waste water systems to Viola and West Valley Water. The deal was for 30 million dollars, tonight it was brought up that there is an additional 5 Million the city can borrow, that we have to pay back. There was talk of your 100 percent increase in rates over 4 years would be more if they borrowed that money. City Staff brought up bringing back the Per’s Tax. I’m not familiar with this tax but Council was scared to death of another lawsuit from our friends the Howard Jarvis Taxpayers Association. Apparently Howard Jarvis stopped Rialto from doing this long ago. If they bring it back and Jon Coupal wants to sue on a residents behalf I will be first in line. Everyone kept saying we don’t want to raise taxes then talked about a new way to tax the community. Also Transparency is the buzz word right now all of the Council People want to provide it even though they have been hiding things from us for years. Even June Hayes RUA Committee member was blown away by the new talk of 5 million in available borrowed money. Ed Scott tried to equate the 5 million to a homeowner who buys a house then finds out they qualify for more money and takes it. A homeowner can only take more money if the value of the house meets the desired loan amount. Also its not free money it does raise the interest and principle monthly payment. So 5 million is what percent of 130 million its 3.84 percent almost a filth of the entire loan and when your talking millions that’s not chump change. *Water and Waste Water rates will go up for the next four years. *Rialto wants you to possibly pay 12% on your UUT (up from 8%). *Rialto pays 8-10 cents more per gallon than cities like San Bernardino that have higher sales tax than Rialto. *Late fees were increased largely in part to Mr. Everyone Else Is Doing It Why Not Us. First off plan on being at the UUT Workshop on 11-20-12 at 6pm. Second call, email and ask him in person if given the opportunity. Him I mean Joe Baca Jr. who for some reason refuses to attend the UUT workshop on 11-20-12 he claims to have plans. So do I Mr. Baca my parents will be in that week from out of state yet I will be there and I am not a paid member of the city of Rialto just a concerned resident. 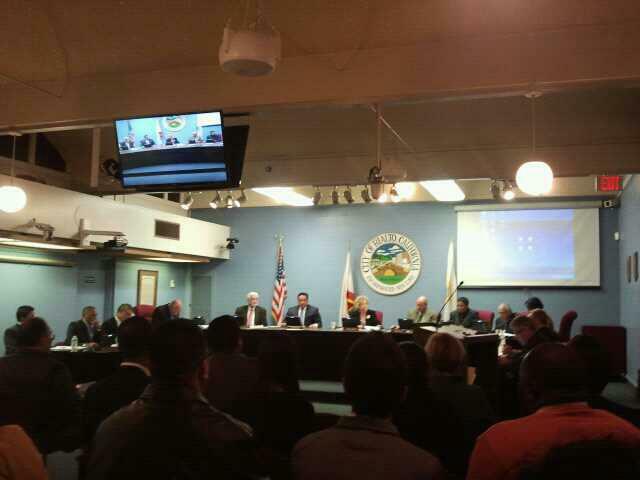 Second attend the Council Meeting on 11-27-12 because there they will make the final vote to officially sell off the water and waste water, vote on whether to put the UUT on the ballot in March and at what percent and its the last day for Ed Scott, Mayor Grace Vargas and Deborah Robertson’s last day as a council member so there may be some interesting exchanges at this meeting. Tomarrow I will Re-cap the rest of what I stayed for.